An original can't be invented in 1939 and again over 10 years later. An original is an original, one of a kind. dwells said, "For me, the Cho Cho is an ice cream bar with some crunch on the outside." 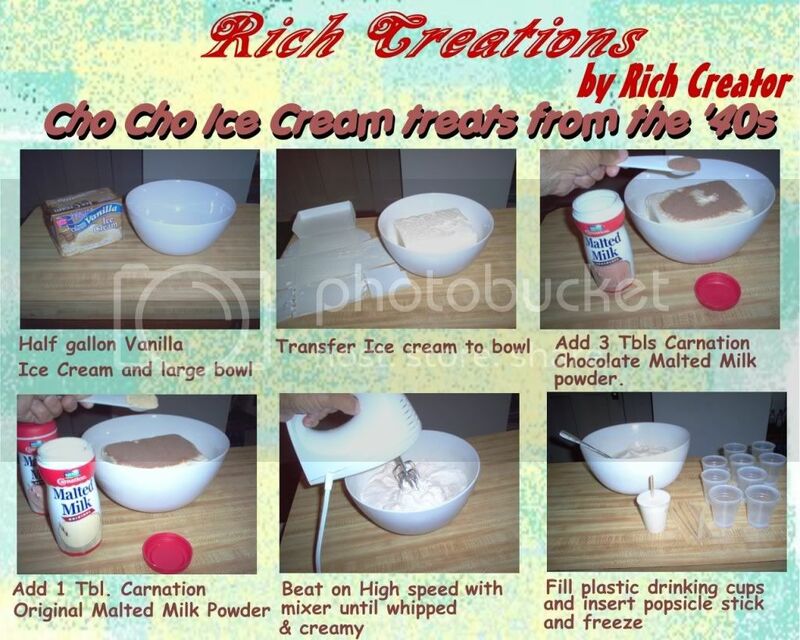 The original cho cho was an ice cream in a cup. It was not an ice cream bar with a crunch. You did not have the original cho cho. You had an imitation...a copy, with a different shape and a different taste. I don't know why you are trying to change the originality of the cho cho and you are not going to ever have The Popsicle Co. ever make an original cho cho. When the original cho cho changed from selling in a cup to selling as an ice cream bar, it ceased to be an original. And, all the cho cho's sold after the original, did not have the same unique malt taste as did the original cho cho's. You cannot find a cho cho close to the original taste other than my recipe. You can ignore to make my cho cho recipe and twist the whole concept of cho cho's around every which way but you are only fooling yourself and those who choose to believe you. more info This thread has ceased to be fun and informative since we now have THE original opinion on the subject. more info Yes, this was always a fun site to remember the 50's. I hope it goes back to being nice. The Cho Cho was in a cup as shown in a previous reply. I have the same cup at my home. It was from the lat 40's early 50's. Any future replies should be nice. And, thank you Diana for giving us this resource to talk and remember. I appreciate you. more info Unless Richcreator is 70+, he doesn't know what he is talking about. more info ...what is happening here? Yep, this was a really fun site and I, for one, connected with others who remembered food/school/fun of San Francisco in the 50's. Sigh. Also learned that SF wasn't the only city with Cho Cho's. I think I am just going to run out and get a malt and forget the quest. It was fun to see the old Cho Cho cup on the site again. bademento posted: Unless Richcreator is 70+, he doesn't know what he is talking about. If you wish to participate in this particular discussion about the cho cho, it would be wise and intelligent to read the thread so you don't make idiotic remarks. I said, on 07-20-2009 @ 10:03 AM that. . . . . I was born in Reading, PA in 1935, same year as Elvis. This makes me 73 years of age. In fact, I'll be 74 next week. You can either enjoy an original cho cho by following my recipe and making it yourself or do without waiting in vain wishing and hoping for some popsicle company to make it for you. Unless Richcreator is 70+, he doesn't know what he is talking about. I'm 12 years younger than Richcreator and I well remember Cho-Cho's - in a cup - from my youth in north-central Illinois. A web search for Cho-Chos is what led me to this forum. I enjoyed learning that there were several other version of Cho-Cho extant. I do hope that one poisonous attutude won't spoil the fun. And, Rich, I do appreciate your making your recipe available to us. more info Up until now, this site was for cho cho on a stick that you roll in your hands. And if someone mentioned another type, that was fine. And, no one asked to be thanked for their input, as Rich whatever. That was when people got a sour taste in their mouth. He was put out that we didn't thank him. He is so funny and so prepostureous. more info Hey Bademento, Did you ever try the Cho Cho's from PA? Just wondering if they were the same as the ones in the little clown cup. I just reread the blog and remember that you paid $160 for the ones from Tucker's. Poor you, those are just plain disappointing. Tom N is the other native SF person who also remembered Cho Cho's and I think he bought the cup.